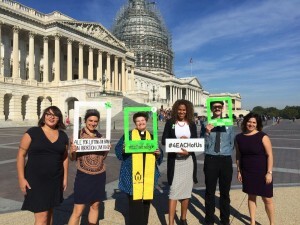 I had the awesome opportunity to represent Social Workers for Reproductive Justice along with the Sexual Violence Center (where I work) in D.C. last week! I was invited by Pro-Choice Resources in Minneapolis to join the other 200 other delegates from 25 states and the District of Columbia to Capitol Hill Education Day with All* Above All, a public education campaign uniting organizations and individuals who support lift the bans that deny abortion coverage. 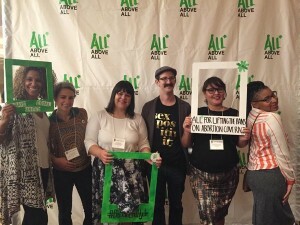 Since 2012 All* Above All and its more than 90 partner organizations and other dedicated allies have begun to transform the landscape for low-income people making decisions about their reproductive lives. Our goal as delegates was to educate representatives about a brand new piece of legislation in the House called the Equal Access to Abortion Coverage in Health Care (EACH) Woman Act in hopes that they would co-sponsor the house bill or help advocate for the development of a senate bill. The EACH Woman Act makes meaningful policy changes for people making decisions about whether to carry a pregnancy to term by creating two important standards: 1) It sets up the federal government as a standard-bearer, ensuring that every women (or person who can become pregnant) receives care or insurance through the federal government will have coverage for abortion services, so restores coverage to those enrolled in a governmental insurance plan (ie: Medicaid, Medicare), enrolled in a government-managed health insurance program (TRICARE, FEHBP) or receiving health care from a government provider or program (ie) Indian Health Services, Federal Bureau of Prisons, the Veterans Administration). Secondly, the act prohibits political interference with decisions by private health insurance companies to offer coverage for abortion care. This would essentially reverse the discriminatory Hyde Amendment, which bans federal funds from being used on abortion and disproportionately impacts low-income women and women of color. Minnesota is extremely progressive in that we are one of only 13 states that uses state Medicaid dollars to pay for abortion, but even with this, there are many instances (see above) where people are left paying out of pocket for the procedure. Though we were there advocating for the ability for ALL people to be able to make choices about whether to carry a pregnancy to term without cost being a factor in that decision, a few of us got to represent a specific group of people in order to shed light on the way this legislation would impact individuals. Because of my affiliation with the Sexual Violence Center in Minneapolis I got to speak on behalf of victims/survivors who have become pregnant due to an assault. The talking points were simple: With the costs: emotional, mental and financial that victims/survivors endure during whatever route they choose to take on their healing journey, an additional financial cost to terminate a pregnancy caused by the assault should absolutely not be a factor. Total no brainer! We will be following up with the representatives we met with in coming months to remind them of our talking points and reinforce our invitation for them to co-sign the bill if members of the House or support the effort in the Senate for the creation of a Senate Bill. You may see others posting about the EACH Woman Act in coming weeks and months. Reading up about the bill and sharing posts to spread the word are initial ways that folks can show support for this groundbreaking legislation.